PowerPoint, and frankly lots of other programs, allow you to save out, export, publish, etc. in numerous ways. Many of the ways will have complete relevance to you and some of them won’t. But most of them will have perfect relevance to you and you didn’t even know! Get ready for the # ways to Export/Save/Publish in PowerPoint 2016. PowerPoint Presentation (.pptx): This format is the default PowerPoint file. It will always automatically save out in this file type. All features and elements are the same. PowerPoint Macro-Enabled Presentation (.pptm): This format allows for VBA coding (Visual Basic Applications). This allows for coding variables and tracking elements that PowerPoint doesn’t normally handle on its own. PowerPoint 97-2003 Presentation (.ppt): This format allows your presentation to be compatible with the older versions of PowerPoint. Be aware that you may lose the functionality of most features that are present in the current version. PDF (.pdf): Saving as a PDF will allow you to keep the format of the PowerPoint (not necessarily the functionality) and permits it to be shared across platforms. XPS Document (.xps): XPS is a similar and less used version of a PDF. The difference comes in how you view the document. You don’t need a viewer to view the file, similar to how a PDF is viewed. PowerPoint Template (.potx): This allows you to save out a project as a template (kind of self explanatory). You can then used the saved project (template) to create other projects with the same project skeleton. PowerPoint Macro-Enabled Template (.potm): This format allows you to make a project and save it out as a template, but it allows for basic coding to push your template further than PowerPoint can on its own. PowerPoint 97-2003 Template (.pot): This is like the other template format files, but this one is able to function in the older versions of PowerPoint. Office Theme (.thmx): This format allows you to save out themes (such as the built-in themes that PowerPoint contains) that you have created while in the project. PowerPoint Show (.ppsx): This format is actually very helpful when you are wanting to look as professional as possible. When you sent this file over to your boss or someone like that, it will automatically open up in the Slide Show View. The ability to edit and modify the presentation will be disabled. PowerPoint Macro-Enabled Show (.ppsm): Similar to the PowerPoint Show file, this will allow a presentation to have Macros (a basic coding language, otherwise known as VBA coding) built into it that will run in a slide show setting. PowerPoint 97-2003 Show (.pps): This is simply a slideshow that will pop open as it is clicked on. It is compatible with the older versions of PowerPoint. PowerPoint Add-In (.ppam): This format allows you to save out your project as an add-in. Meaning that you can modify the project with VBA coding and special add-in commands that you can then insert into other PowerPoint software systems (on other computers). PowerPoint 97-2003 Add-In (.ppa): This format will save your project in a way that an add-in can be inserted into an older version of PowerPoint. PowerPoint XML Presentation (.xml): This format lets you save out your presentation with text and binary information only. This is helpful for some people who are coding and dabbling in VBA. MPEG-4 Video (.mp4): This saves the project as a video, allowing you to present it on systems don’t have PowerPoint installed. Every computer will play a video file. The only thing that you need to do before hand is set a time for each slide, so you can modify the video to meet your needs. Windows Media Video (.wmv): This format is very similar to the other video file that you can save it out as. There is hardly any differences worth mentioning. GIF Graphics Interchange Format (.gif): This is format that converts your project into images that will show in the order that they are created. It will repeat over and over as long as it is specified. It is very good for web sources and minimal graphic projects. JPEG File Interchange Format (.jpg): This is similar to the GIF, only that it supports around 16 million colors. This format is best when you desire an interchanging graphic of complex photos and assets. PNG Portable Network Graphics Format (.png): This format converts all the slides within your project into photos. This is a versatile format, allowing you to use the photos in any manner that you may need them for. Such as web images, or just print them off on a piece of paper. You can even put images of your presentation into another presentation! TIFF Tag Image File Format (.tif): This format allows you to skew and blow up the images of your slides as much as is needed. It is similar to the PNG format. Device Independent Bitmap (.bmp): This converts your project into bitmaps. Which is a multitude of little dots that make a photo of each of your slides. This can also be blown up to the desired size. Window Metafile (.wmf): This is a file that converts your project into a 16 bit graphic. It is only used on very old versions of Windows. Enhanced Windows Metafile (.emf): This file format converts your project into a 32 bit graphic. Also only to be used on very old versions of Windows. Outline/RTF (.rtf): This format is a text only format that allows you to easily share information with people who may not have the same version of PowerPoint as you. It is macro, and note free. PowerPoint Picture Presentation (.pptx): This format turns every slide into a photograph. It is similar to the PNG formats. No editing can occur after your project has been saved out in this format. Be careful, because the extension for this format is the same as the default format, you need to change the name of this file to avoid making your project uneditable. Strict Open XML Presentation (.pptx): This format is similar to the other XML format. It has a few changes that will disable you from seeing some features when crossing your project over to an XML processor. OpenDocument Presentation (.odp): Saving out your project in this format will allow you to open the presentation in Google Docs and Open Office Impress. It can also be opened in the default PowerPoint software. In almost every software program, there is a Save feature that can make or break your project/game. PowerPoint allows you to save your projects in a variety of different ways to meet all the needs and specifications that you require. 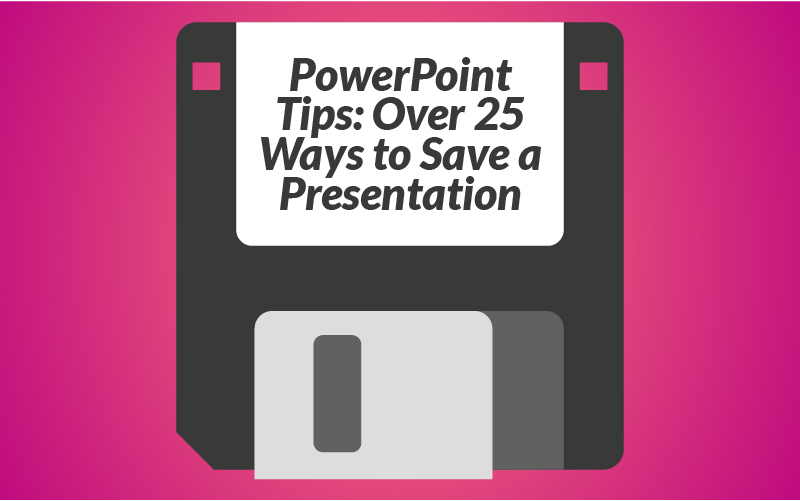 Let me know in the comment section below how these 28 awesome PowerPoint tips have helped you in discovering new ways to create an amazing presentation.